I’m really excited that we opened a call for proposals today for Augmented World Expo (registration opens February!). Our edgy conference on augmented reality has morphed into the world’s first Expo about the augmented world. 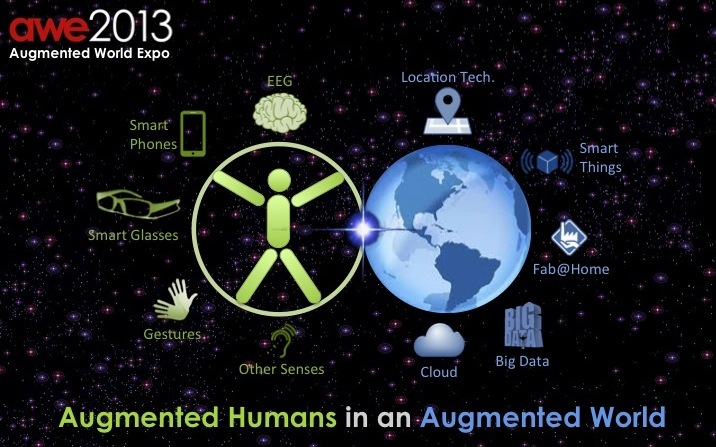 If you loved ARE you are going to find Augmented World Expo the most important event of 2013, and if you never got a chance to attend before register early to reserve your spot! “The way we experience the world will never be the same. We no longer interact with computers. We interact with the world. A set of emerging technologies such as augmented reality, gesture interaction, eyewear, wearables, smart things, cloud computing, and ambient computing are completely changing the way we interact with people, places and things. These technologies create a digital layer that empowers humans to experience the world in a more advanced, engaging, and productive way. Augmented World Expo will bring together the best in augmented experiences from all aspects of life: health, education, emergency response, art, media and entertainment, retail, manufacturing, brand engagement, travel, automotive, and urban design. It will be the largest ever exposition demonstrating how these technologies come together to change our lives and change the world.